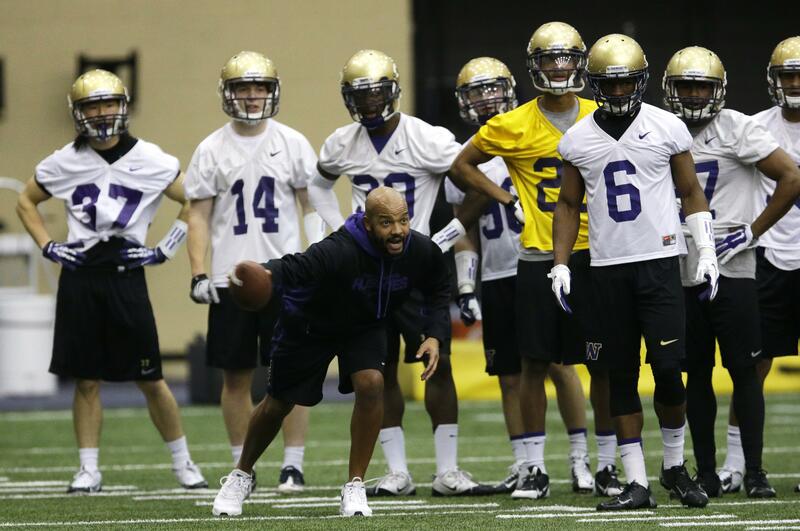 UPDATED: Thu., Jan. 18, 2018, 11:19 p.m.
SEATTLE – Jimmy Lake, one of the most in-demand coaches in college football, will be promoted as Washington’s defensive coordinator and take over as the Huskies’ primary defensive play-caller in 2018, a source confirmed to The Seattle Times. Lake and co-defensive coordinator Pete Kwiatkowski are both expected to receive pay increases that will raise their annual salary to at least $1 million. Kwiatkowski has been the Huskies’ defensive coordinator and play-caller the past four seasons, and under his direction UW has ranked as the No. 1 defense and scoring defense in the Pac-12 in each of the past three seasons. As a means of keeping Lake on staff, Kwiatkowski has agreed to cede the primary play-calling duties but will still be heavily involved in the weekly game-planning, a source said. Over the past month or so, Lake has turned down offers to be the defensive coordinator at Alabama, Florida State, Texas A&M and Arizona State, KJR-AM’s Dave “Softy” Mahler reported. Lake, entering his fifth season on Chris Petersen’s UW staff, has aspirations to become a head coach some day, and being a play-caller is the final missing piece in his sterling coaching resume. Under Lake, the Huskies’ secondary has ranked among the best in the Pac-12 the past four seasons. He has also built a reputation as one of the Huskies’ best recruiters, helping sign Budda Baker, Sidney Jones, Taylor Rapp, Jordan Miller, Jojo McIntosh and Byron Murphy, among others. He is UW’s primary recruiter in Los Angeles. In December 2015, Lake earned a promotion as UW’s co-defensive coordinator and a raise to $500,000. He was awarded another salary increase, to $650,000, for 2017. Kwiatkowski earned a base salary of $875,000 in 2017. A 1998 graduate of Eastern Washington, where he was an all-conference safety, Lake was UW’s defensive backs coach in 2004. He spent five years as an NFL assistant in Tampa Bay and Detroit before joining Petersen’s staff at Boise State in 2012. Lake, who graduated from North Central High School, nearly left UW last year to be the defensive coordinator at Cal. He remained with the Huskies after Cal declined to pay the $500,000 buyout in his UW contract, a source told The Seattle Times. The Huskies last week announced the hiring of Will Harris as the program’s 10th assistant coach. He will assist Lake in coaching the defensive backs. Published: Jan. 18, 2018, 6:48 p.m. Updated: Jan. 18, 2018, 11:19 p.m.